Eugenie Bouchard has begun legal action against the United States Tennis Association after suffering concussion following a fall at the US Open. The Canadian slipped in the locker room at the Grand Slam event in September. She withdrew from the tournament prior to a fourth-round match and pulled out of her comeback event at the China Open on 5 October because of dizziness. The lawsuit alleges the 21-year-old world number 39 slipped on "a foreign and dangerous substance" in New York. It also alleges negligence and includes a demand for a jury trial, with Bouchard seeking damages from the USTA and USTA National Tennis Center. Her lawyer, Benedict Morelli, told the New York Times the substance was a cleaning agent intended to be left on the floor overnight when the room would no longer be used. He claimed they could be seeking damages worth "millions and millions" of dollars. Seeded 25th at Flushing Meadows, the 2014 Wimbledon runner-up suffered a head injury in a fall after playing mixed doubles on 4 September. The lawsuit, filed in the United States District Court for the Eastern District of New York, includes the allegation Bouchard "was caused to slip and fall on a dangerous condition created by the defendants in the physiotherapy room attendant to the women's locker room". It is claimed the defendants either caused or should have known of the floor condition, and that Bouchard was not made aware that it was slippery. 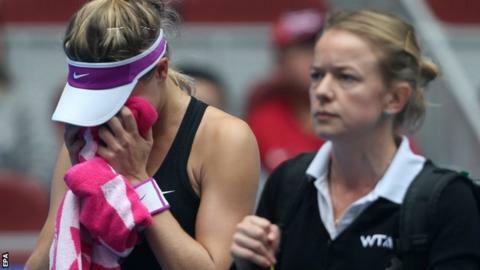 The lawsuit adds Bouchard sustained a "severe injury to her head, including, but not limited to, a concussion", and the injury also caused her to withdraw or retire from the subsequent Japan Open, Wuhan Open, China Open and Hong Kong Open tournaments, resulting in a fall of 13 ranking places. It also says she continues to suffer pain as a consequence of the fall, resulting in medical costs and a loss of income, and it affects her quality of life. The USTA has declined to comment on the lawsuit.